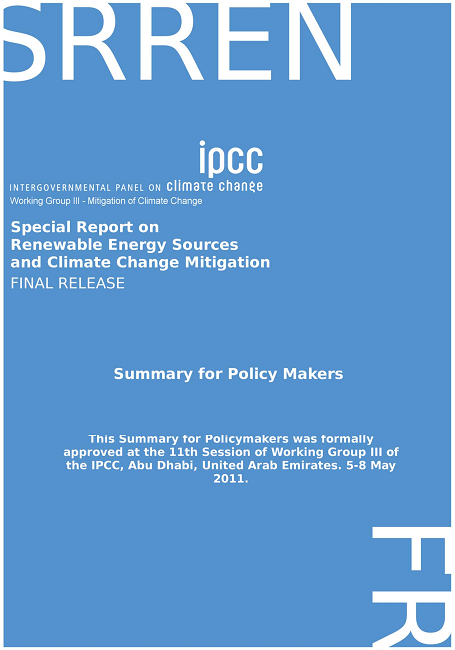 The Special Report on Renewable Energy Sources and Climate Change Mitigation (SRREN), agreed and released by the Intergovernmental Panel on Climate Change(IPCC) on 09 May 2011, has assessed existing literature on the future potential of renewable energy for the mitigation of climate change. It covers the six most important renewable energy technologies, as well as their integration into present and future energy systems. It also takes into consideration the environmental and social consequences associated with these technologies, the cost and strategies to overcome technical as well as non-technical obstacles to their application and diffusion. The chapters are dense, but there is a Summary for Policy Makers which provides an overview of the SRREN. It summarises the essential findings concerning the report`s analysis of literature on and experiences with the scientific, technological, environmental, economic and social aspects of the contribution of six renewable energy sources to the mitigation of climate change. The IPCC has said that on a global basis, it is estimated that renewable energy accounted for 12.9% of the total 492 Exajoules (EJ) of primary energy supply in 2008. The largest RE contributor was biomass (10.2%), with the majority (roughly 60%) being traditional biomass used in cooking and heating applications in developing countries but with rapidly increasing use of modern biomass as well. Hydropower represented 2.3%, whereas other RE sources accounted for 0.4%. In 2008, RE contributed approximately 19% of global electricity supply (16% hydropower, 3% other RE) and biofuels contributed 2% of global road transport fuel supply. Traditional biomass(17%), modern biomass (8%), solar thermal and geothermal energy (2%) together fuelled 27% of the total global demand for heat. The contribution of RE to primary energy supply varies substantially by country and region. Deployment of RE has been increasing rapidly in recent years. Various types of government policies, the declining cost of many RE technologies, changes in the prices of fossil fuels, an increase of energy demand and other factors have encouraged the continuing increase in the use of RE. Despite global financial challenges, RE capacity continued to grow rapidly in 2009 compared to the cumulative installed capacity from the previous year, including wind power (32% increase, 38 Gigawatts (GW) added), hydropower (3%, 31 GW added), grid-connected photovoltaics (53%, 7.5 GW added), geothermal power (4%, 0.4 GW added), and solar hot water/heating (21%, 31 GWth added). Biofuels accounted for 2% of global road transport fuel demand in 2008 and nearly 3% in 2009. The annual production of ethanol increased to 1.6 EJ (76 billion litres) by the end of 2009 and biodiesel to 0.6 EJ (17 billion litres). Of the approximate 300 GW of new electricity generating capacity added globally over the two-year period from 2008 to 2009, 140 GW came from RE additions. Collectively, developing countries host 53% of global RE electricity generation capacity. At the end of 2009, the use of RE in hot water/heating markets included modern biomass (270 GWth), solar (180 GWth), and geothermal (60 GWth). The use of decentralized RE (excluding traditional biomass) in meeting rural energy needs at the household or village level has also increased, including hydropower stations, various modern biomass options, PV, wind or hybrid systems that combine multiple technologies. Climate change will have impacts on the size and geographic distribution of the technical potential for RE sources, but research into the magnitude of these possible effects is nascent. Because RE sources are, in many cases, dependent on the climate, global climate change will affect the RE resource base, though the precise nature and magnitude of these impacts is uncertain. The future technical potential for bioenergy could be influenced by climate change through impacts on biomass production such as altered soil conditions, precipitation, crop productivity and other factors. The overall impact of a global mean temperature change of less than 2°C on the technical potential of bioenergy is expected to be relatively small on a global basis. However, considerable regional differences could be expected and uncertainties are larger and more difficult to assess compared to other RE options due to the large number of feedback mechanisms involved. For solar energy, though climate change is expected to influence the distribution and variability of cloud cover, the impact of these changes on overall technical potential is expected to be small. For hydropower the overall impacts on the global technical potential is expected to be slightly positive. However, results also indicate the possibility of substantial variations across regions and even within countries. Research to date suggests that climate change is not expected to greatly impact the global technical potential for wind energy development but changes in the regional distribution of the wind energy resource may be expected. Climate change is not anticipated to have significant impacts on the size or geographic distribution of geothermal or ocean energy resources. The levelized cost of energy for many RE technologies is currently higher than existing energy prices, thoughin various settings RE is already economically competitive. Ranges of recent levelized costs of energy for selected commercially available RE technologies are wide, depending on a number of factors including, but not limited to, technology characteristics, regional variations in cost and performance, and differing discount rates. Some RE technologies are broadly competitive with existing market energy prices.